sticky finger prints everywhere for the rest of the day! 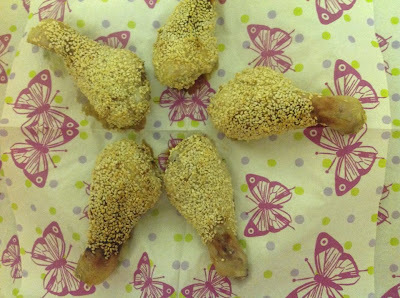 It also helps if you don't coat the whole drumstick, but leave a little handle, to allow for easy eating! The picture is, as usual, hopeless! Please don't let it put you off trying it, it's brilliant for fussy eaters, as it's easy to eat and it's amazing what little ones will try when they've 'made' it themselves! As fussy eaters came up in discussion on the FB page, I thought this would be a nice one to share. Sesame Seeds, spread out on a plate. 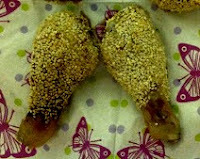 Coat the chicken with the honey and soy sauce mixture, then roll each drumstick in the sesame seeds, before placing on a lightly greased baking tray. Roast for 25 mins at 190C.